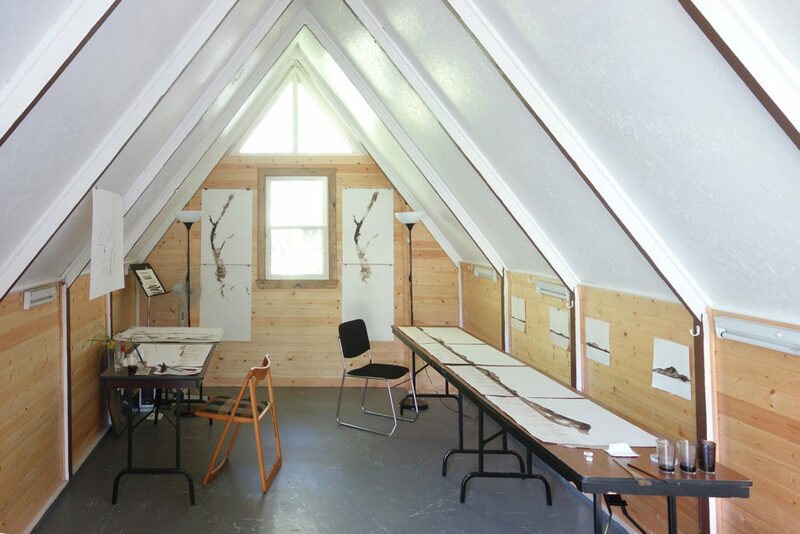 While I was an artist in residence at the Orford Center in June-July 2018 I worked in response to the local site from an old cabin converted into a studio. It was small and had no conveniences such as internet, but the perfect size and atmosphere for painting. 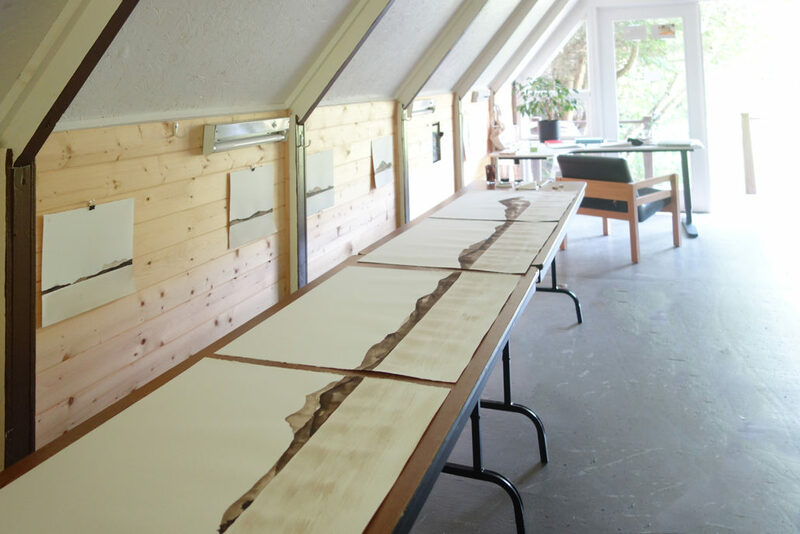 I started with ink works made directly with water from the pond in front of the studio, continued with rainwater and completed two larger works with water from the nearby Lake Memphremagog. 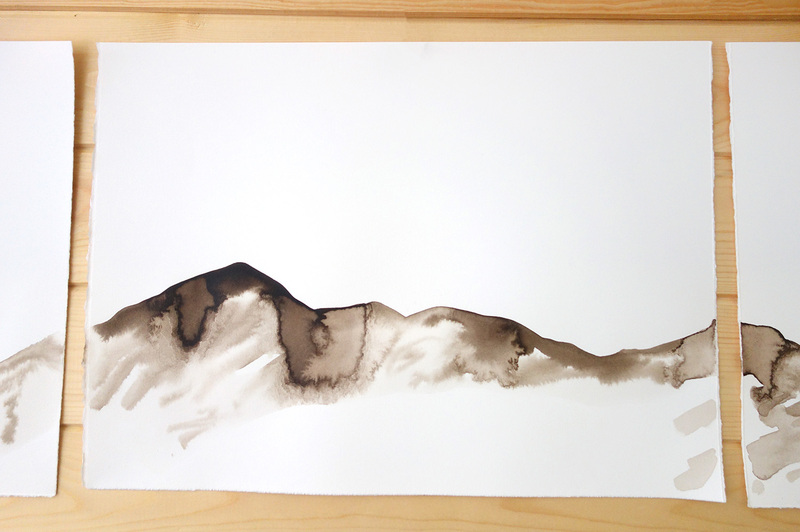 Memories of the lake stood out in the conversations I had with local residents, so I chose to paint the mountains and waterways often while in residence. 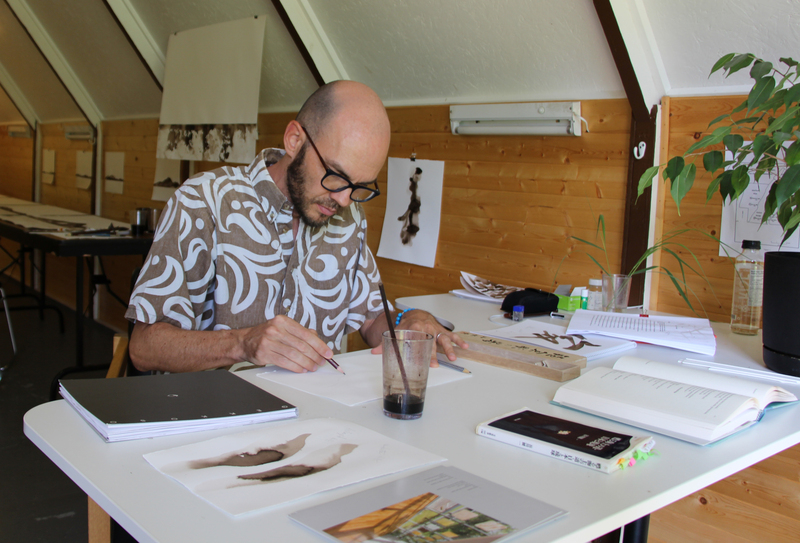 Each work was made from a combination of site visits and direct observation early on. Though the finished works were all made based on memories and seen with the inner eye. This gave the works a balance between forms that Quebec residents found familiar along with the workings of my inner heart. 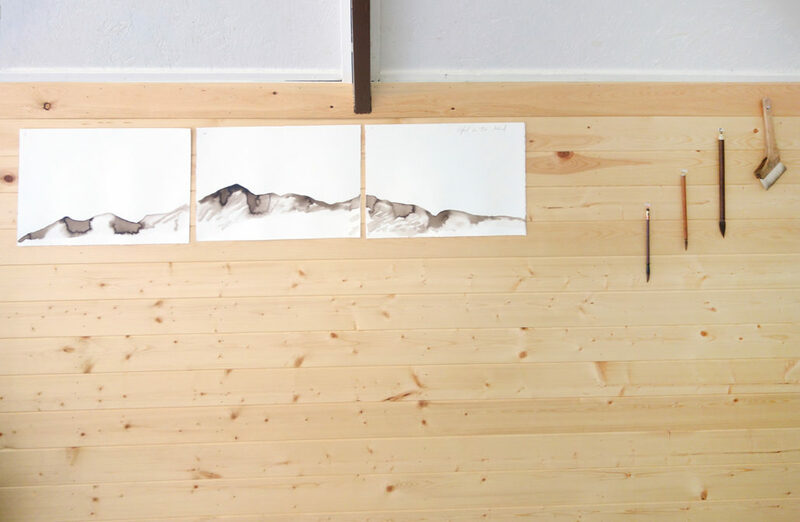 The triptych painting titled “Orford in the Mind” seen while in progress on the studio wall alongside my brushes. This work was painted the morning after hiking the mountain together with close friend and gallerist Anick Valiquette who was my generous guide to the region. 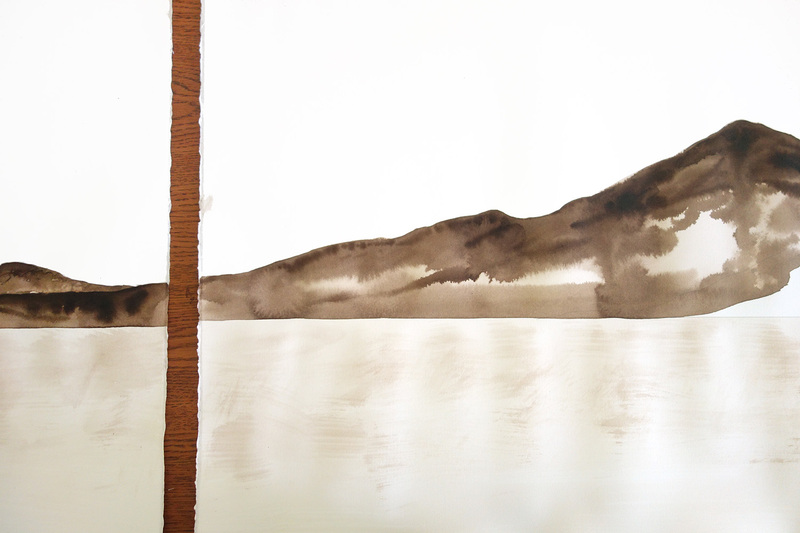 Detail of the previous painting showing the nuances of walnut ink painted in the humid summer air of Orford. Detail of the work “For the Next Generation” a four-panel painting that was created during the residency. This was a large undertaking that consumed the last half of my residency. 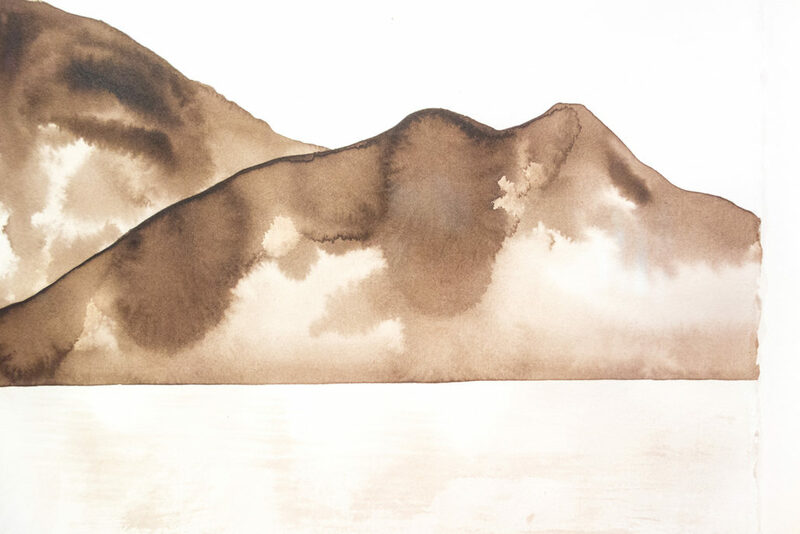 The lake below was painted delicately with water from Memphremagog to include the spirit of the lake, while the mountains were painted boldly with handmade walnut ink in tune with the softness of the mountains. 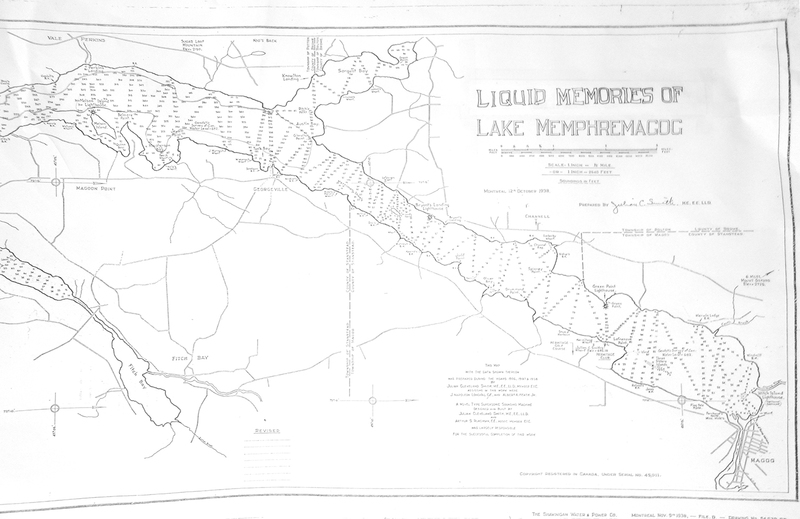 A map of the depths of the lake in which I modified the title to include “memories” while executing a diptych painting completed on site. This work will be featured in the WORKS section along with installation views of the exhibit posted shortly. The resonance of Orford lives on in the mind of all those who experience these unique artworks and the air/water they breathe.